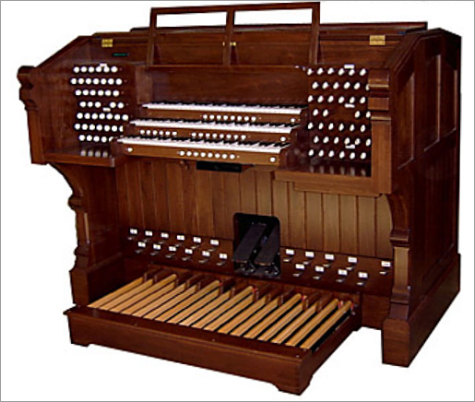 The famous E. & G. G. Hook & Hastings organ, Opus 801, 1875, now has a new console designed to match the original console which was replaced by a used theater organ console ca. 1929 when the organ was electrified by William W. Laws. Al Hosman built the new console, which does have some of the modern conveniences such as a solid-state combination action. The console design is taken from the one existing drawing and the only known photograph showing only the upper portion of the console. The three manuals of 58 notes are covered in non-endangered ivory naturals and ebony sharps. The Pedalboard is flat with 30 notes. 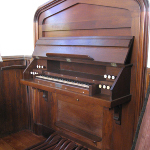 It has vertical jambs with oblique rosewood knobs and engraved inserts. The couplers are kept to a minimum, duplicating those of the original specification and adding only Swell and Choir to Great 16' couplers. No division has octave or sub octave coupling. All couplers appear on drawknobs. There are no toestuds as such, but pedals modeled after Hook & Hastings style. The console is made of black walnut, with panels modeled after existing E. & G. G. Hook & Hastings detached consoles of the period. 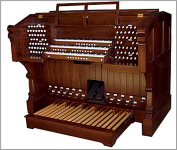 In addition to the console, a completely new multi-system by Solid State Organ Systems was installed, operating the entire organ. 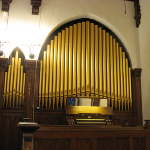 All wiring in the organ was replaced and brought up to current electrical codes. 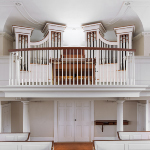 The Swell pull-down and stop actions were releathered and restored by Joe Rotella of Spencer Organ Company. The missing 8' Doppel Flöte on the Great was replaced with another Doppel Flöte from the Swedenborgian Hook, Opus 355, 1865, under the direction of tonal director Robert C. Newton. The main difference is that the new console's keyboards have modern spacing between them. The Hook spacing was the result of the pneumatic mechanisms that operated the couplers between the keyboards, making the distance much greater.